WANT A MUSTANG?? This Pony has it all. All options of a GT without the price tag. Customized from Head to Toe. The 2013 Ford Mustang with Pony Packge now comes standard with steering wheel mounted audio controls and HID headlights. equipped with a 3.7-liter V6 engine that produces 305 hp linked toa 6 speed automatic. Fuel mileage falls within an EPA estimate range of 18 mpg city to 31 mpg highway. Features include electronic power assist steering and hands-free capabilities. Safety is comprised of anti-lock braking, brake assist, stability control, and advanced airbags. 120 Point Mechanical Inspection passed and certified. Best Selection of Preowned vehicles. Need Financing?? Call 239.288.7701 for your guaranteed approval. Thank you for visiting our webpage! We are currently updating more photos and a detail description of this vehicle. 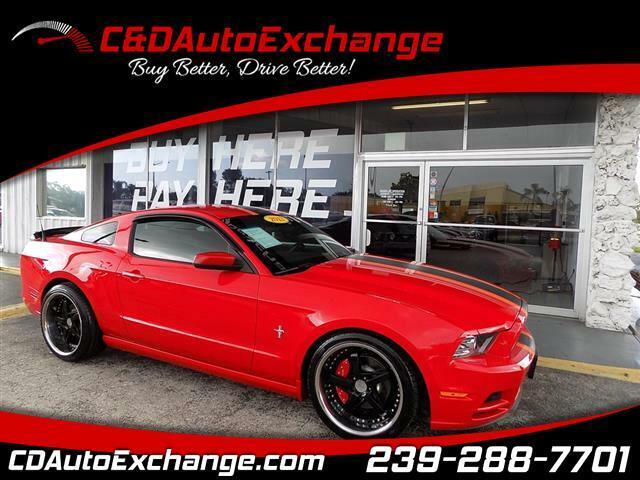 Visit C & D Auto Exchange online at cdautoexchange.com to see more pictures of this vehicle or call us at 239-573-3600 in Cape Coral 1036 NE pine island rd. today to schedule your test drive. You can also Apply Online for Your Guaranteed Approval.